Protein blend (milk protein isolate, whey (milk) protein isolate, milk protein concentrate, calcium caseinate (milk), emulsifier: soy lecitin), dark chocolate flavour coating (18%) (sweeteners: isomalt, sucralose; non-hydrogenated palm and palm kernel oil, fat-reduced cocoa powder, emulsifiers: soy lecithin, e476), humectant (glycerol), sweeteners (sorbitol, erythritol, sucralose), fructooligosaccharides, isomaltooligosaccharides, sunflower oil, fat-reduced cocoa powder, white chocolate flavour drizzle (1%) (sweeteners: isomalt, sucralose; non-hydrogenated palm and palm kernel oil, whey* powder, wheat flour [gluten], emulsifier: soy lecithin; flavouring), flavourings [milk], sodium chloride, antioxidant (tocopherol-rich extract). 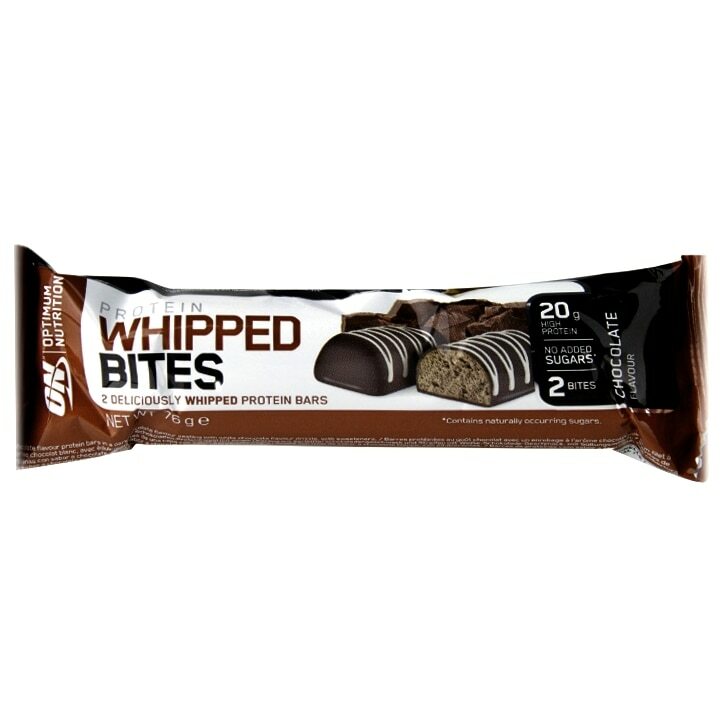 Optimum Nutrition Whipped Bites Chocolate is rated 5.0 out of 5 by 7. Rated 5 out of 5 by kamal0003 from So Tasty The good thing about protein bar is that we can have it anywhere anytime and avoid catabolism. The best thing about ON Bar it's SOOOOO TASTY !